Oberlin – June 2006 | The New York Baroque Dance Co. 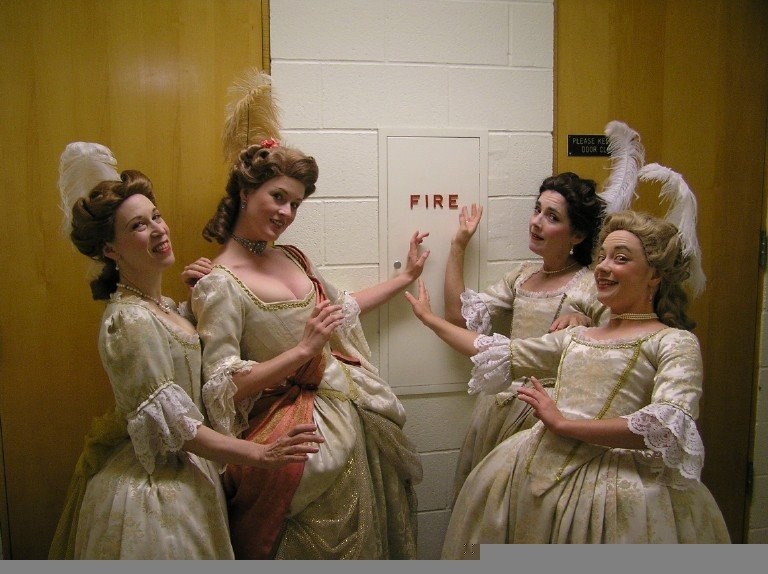 This photo was taken backstage at Oberlin College and shows Terpsicore (Caroline Copeland) instructing her Graces (Patricia Beaman, Sarah Edgar, and Rachel List) in the proper ways of incorporating the elements into one’s dancing to properly describe various states of love, as per Apollo’s command. AIR and WATER had already been discussed, and now Terpsicore had moved on to the more advanced concept of FIRE. Our happy group was completed by the lovely Jennifer Lane in the role of Apollo and the equally lovely Kendra Colton who sang Erato and took this historic photograph.